When you think of upgrading your Subaru suspension and lowering your vehicle, you probably have some of the same priorities in mind that B&G Suspension does. B&G Sport Lowering Springs for Subaru are engineered to improve handling while maintaining safety and ride quality. B&G Sport Lowering Springs for Subaru also will give your vehicle an aggressive look. 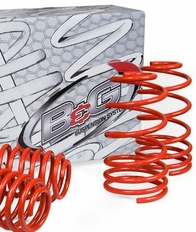 B&G Lowering Springs for Subaru have all of the features that you're looking for: First, B&G Subaru Lowering Springs feature progressive spring rates. This means that they have multiple spring rates to maintain a quality ride while significantly improving handling, cornering, and providing an aggressive vehicle stance. To top it off, B&G Suspension is so confident in the superior quality of their Subaru lowering springs and suspension products that they offer a lifetime warranty on them. The part number for this item is: 86.1.014 and it fits: 1991-1999 Subaru Legacy (Wagon Only) (do not fit the Outback) models. This set of 4 springs will lower your vehicle by 2.0" in the front and 1.75" in the rear.